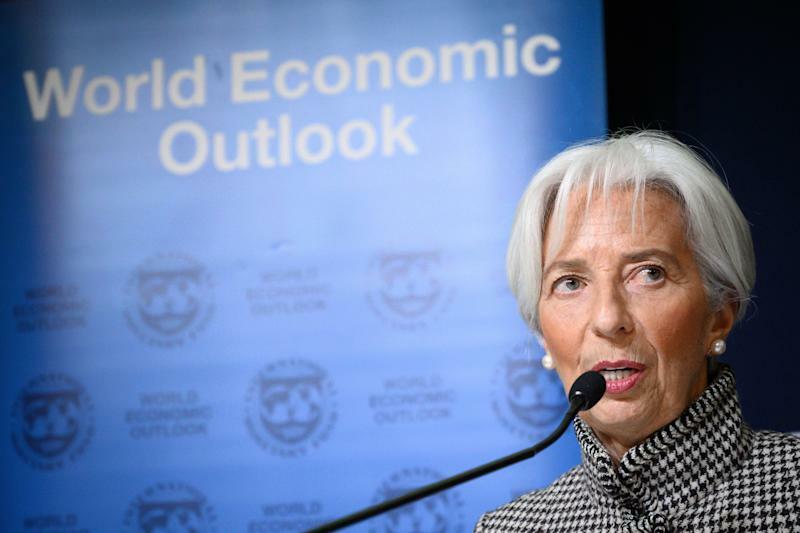 The International Monetary Fund just uncorked a sobering outlook on the global economy and asset markets for the elite billionaires huddled up in Davos, Switzerland for the World Economic Forum to ponder. In its latest World Economic Update report, the IMF said Monday the global economy is projected to grow at a meager 3.5% this year and only accelerate to 3.6% in 2020. The outlooks for 2019 and 2020 are 0.2 percentage point and 0.1 percentage point below the IMF’s projections issued in October. Hat tips to the ongoing U.S. trade war with China, tightening financial conditions globally and more volatile risk asset markets. The finer points: The IMF pretty much had nothing good to say on the outlooks for developed and emerging markets. Although that is nothing unusual for the IMF — who often takes a cautious stance on its outlooks for economies and financial markets — it may give many investors a wake up call amid a somewhat hot start to the stock market in 2019. Of note, U.S. growth is seen slowing to 2.5% in 2019 and dipping to 1.9% in 2020 at the hands of the unwinding of fiscal stimulus (see Trump tax cuts), higher interest rates and the U.S. trade war with China. The IMF tossed the U.S. a bone by noting the pace of expansion is above the country’s estimated potential growth in both years. As for Europe, the IMF is now more bearish on growth compared to its October outlook. Growth for emerging and developing Europe in 2019 is forecast to cool to 0.7% (from 3.8% in 2018) and then bounce to 2.4% in 2020. Previously, the IMF was looking for growth of 2% and 2.8% in 2019 and 2020, respectively. Lackluster growth in Italy, France and Germany as well as policy tightening in Turkey are the main culprits for the IMF’s European growth downgrade. Growth in emerging and developing Asia is expected to drop from 6.5% in 2018 to 6.3% in 2019 and reach 6.4% in 2020, said the IMF. The IMF expects growth in China to be 6.2% both in 2019 and 2020 versus 6.6% in 2018. Interestingly, the IMF incorporates the impact of continued tariffs by the U.S. on China and vice versa in its baseline forecast. In other words, the organization does not expect there to be a trade truce between the countries on their self-imposed March 1 deadline. For the investors out there: For those bulls that have returned to beaten up stocks in January, the IMF does its best to squash the hopium infiltrating your brains. “A range of catalyzing events in key systemic economies could spark a broader deterioration in investor sentiment and a sudden, sharp repricing of assets amid elevated debt burdens. Global growth would likely fall short of the baseline projection if any such events were to materialize and trigger a generalized risk-off episode,” cautioned the IMF. China’s growth slowdown is also a risk that the IMF suggests investors don’t fully appreciate. “As seen in 2015–16, concerns about the health of China’s economy can trigger abrupt, wide reaching sell-offs in financial and commodity markets that place its trading partners, commodity exporters, and other emerging markets under pressure,” the IMF pointed out. The bottom line: The IMF isn’t exactly super plugged into global asset markets in the same vein as forecasters at Goldman Sachs and Morgan Stanley. But their latest assessment of the global economy and risk markets offers up a good counterbalance to the enthusiasm that has begun to creep back into financial markets after the October 2017 through December 2018 rout.